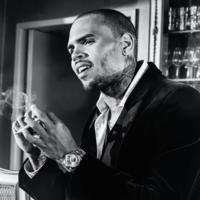 Christopher Maurice "Chris" Brown (born May 5, 1989) is an American recording artist and actor. He made his recording debut in late 2005 with the self-titled album Chris Brown at the age of 16. The album featured the hit single "Run It! ", which topped the Billboard Hot 100, making Brown the first male artist to have his debut single top the chart since Montell Jordan in 1995. The album has sold over two million copies in the United States and was certified double Platinum by the Recording Industry Association of America (RIAA). Brown's second studio album, Exclusive was released worldwide in November 2007. It spawned two successful singles; his second U.S. number one hit, "Kiss Kiss" featuring T-Pain and "With You", which peaked at number two on the Billboard Hot 100. Brown has released a deluxe version of his album called The Forever Edition. The first single from it, "Forever", was released in May 2008 and reached number two on Billboard Hot 100.Exclusive has been certified Platinum by the RIAA. The third studio album, titled Graffiti, was released on December 15, 2009. The first official single was "I Can Transform Ya", featuring Lil Wayne and Swizz Beatz, which peaked at number-twenty on the Billboard Hot 100, becoming Brown's eighth Top 20 hit on that chart. In addition to his solo commercial success, Brown has been featured on several hits such as "No Air", a duet with singer Jordin Sparks, "Shortie like Mine" with the rapper Bow Wow and "Shawty Get Loose" alongside Lil Mama and T-Pain. The songs have peaked on number three, number nine and number ten on the Billboard Hot 100 respectively. Due to his dance routines, Brown has been compared to renowned R&B artists such as Usher and Michael Jackson, citing both as large influences on his music. In 2009, Brown pleaded guilty to felony assault of singer Rihanna, and was sentenced to five years probation and six months of community service.